Your Kawasaki street bike is an investment, and as such, you must do what's needed for it to maintain its value. The Kawasaki motorcycle repair manuals we sell are the best available and they are written for do-it-yourself mechanics who want to take care of their own bikes. These shop manuals feature step-by-step disassembly and reassembly procedures, accompanied by hundreds of photos so you can repair, service and maintain your Kawasaki street bike just like pro bike shops do. Need to fix your Kawasaki? Keep your Kawi in good running order by performing regular maintenance on it. These manuals also serve as exceptional Kawasaki motorcycle service manuals. Having the right repair manual in your toolbox is like having a Kawasaki mechanic by your side guiding you. Clymer and Haynes manuals are written for the weekend DIY mechanic, and they provide easy to follow text instructions accompanied by photo close-ups of the component being worked on. This attention to detail makes them easy to understand and use. In a Kawasaki motorcycle manual designed for your particular year and model, you will find all sorts of information on bike disassembly, service, repair and reassembly, which will allow you to perform the most basic maintenance tasks all the way to a complete Kawasaki restoration, if so desired. 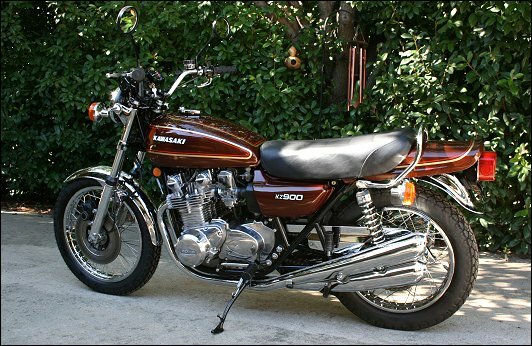 Above: Bob Garlick's 1976 Kawasaki KZ900 restoration project. Started February 15, 2010. Completed December 28, 2010. Double Oak, TX.